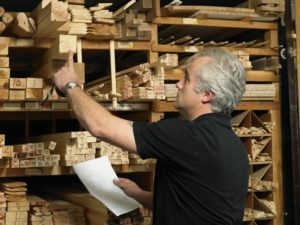 Choosing the right plywood for your project doesn’t have to be difficult. There’s a few key ideas you should familiarize with yourself, however. Plywood is used extensively in construction, furniture building, and more. It gets its strength through alternating veneer layers but this keeps the costs low as well. That strength is defined by its resistance to warping and cracking, keeping your plywood in good shape for years to come. Plywood has more options than most people realize—inexpensive pine might be ideal for subfloors but hardwood veneers are ideal when working with furniture or cabinetry. Let’s take a look at some of the basics of plywood. Plywood is graded so consumers can tell what they need. Depending on what you’re working with, you may not need a high-grade plywood. Grade A wood is free of knots or blemishes, where B has some more natural characteristics of the wood showing. C still retains a good bit of color variation but has some blemishes. Lastly, D has unlimited color variations and blemishes. Depending on what you need, there’s a right grade for you. Some plywood carries that quality over to two sides or just one. You may not need both sides to look fantastic though. If you’re working with furniture and want both sides to be shown, AA or AB grade wood is your best bet. However, if only one side will be visible after your project is complete, consider purchasing AC or AD grade wood. If you’re going to be using your plywood for an outdoor project, make sure you get the correct grade like CDX. Just remember that the X stands for exposure, meaning the glue is only water resistant, not waterproof. To properly waterproof your lumber, it will cost a bit more, but it’s an investment worth making if you want your construction to last. Sheathing and flooring are both common reasons one might purchase plywood. If that’s the case, be sure to use tongue and groove options. This is fantastic interlocking plywoods creates a strong joint to spread loads across the entire floor and make it all that much stronger. This entry was posted on Friday, July 27th, 2018 at 11:08 am. Both comments and pings are currently closed.